Mia Pasticceria / Mia’s tips / Dinner is served… in a cup! Do you want to impress your guests with an original dinner? You can serve all the dishes in a beautiful glass cup! Today, the glass cup is the new trend coming from the United States; it is a new ever-growing fashion symbol, always in respect of the environment and following the principles of recycling. The cup can really become the protagonist of our table, making it more fashionable and creative. Here are the ideas in a cup for a caprese, penne, and parmigiana. These are some easy and always appreciated dishes, of course you can indulge into many other recipes. Cut the tomatoes into slices, removing the two ends of the tomato. Cut the burrata into slices of the same height of the tomatoes, keeping a piece on the side that you will use for the basil sauce. Place the leftover burrata in the jar of the hand blender or mixer, add 3/5 tablespoons of oil, the basil, and some fresh oregano leaves, a pinch of salt and pepper. Blend until you get a smooth and homogenous cream. If the mixture turns out too compact, add a drizzle of oil and blend again. For the composition, spread a little basil sauce on the bottom of the cup, to then place a slice of tomato over it and one of burrata. Spread again some sauce on the burrata layer and repeat the operation until you finish the ingredients. Finally, place a basil leaf on top of the composition, sprinkle a small handful of ground pepper, and add a drizzle of oil. 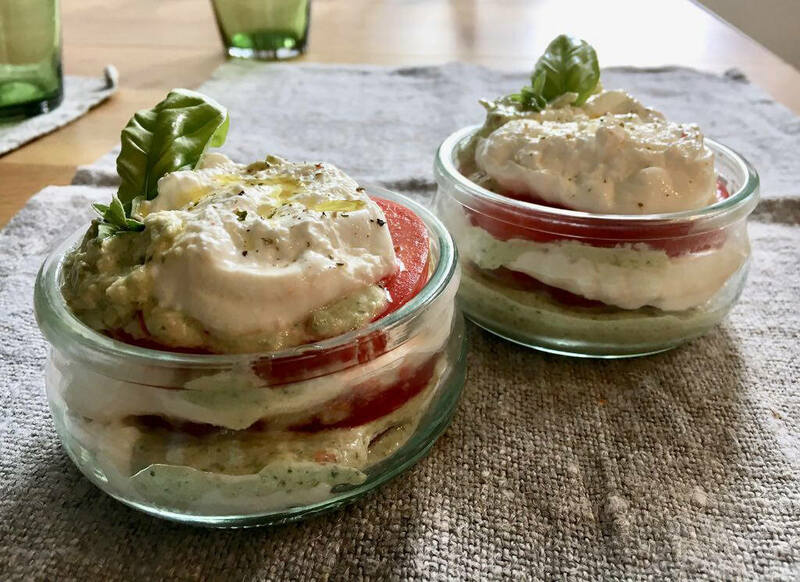 TIP: Both the tomato and the burrata can be kept at room temperature for about an hour before preparing and eating them: they will release more of their flavour! The mezze maniche (smaller penne) in a cup, with chickpeas, dried tomatoes, and caramelised dates, are a healthy and genuine first plate, yet equally tasty; perfect to eat both hot and at room temperature! For our parmigiana we suggest long aubergines. Then cut the aubergines into rounds approximately 5 mm thick, place the slices in a colander and sprinkle with coarse salt to make them release excess water; leave them to rest for at least 1 hour. In the meantime, mince the onion and brown it with a drizzle of oil in the pan for a couple of minutes. Add the tomato puree, adjust with salt and pepper and let it cook on a low flame for about 45 minutes. Add basil after the cooking. If you use fior di latte mozzarella, you need to cut it into cubes and leave them to drain. With mozzarella for pizza, this step is not necessary. Heat up abundant seed oil, in the meantime rinse the aubergine rounds and dry with absorbent paper, to then proceed with the frying. Spread a little sauce on the bottom of a casserole, then form some towers made like this: an aubergine round, sprinkled with parmesan cheese and ground pepper, a handful of mozzarella cubes, and then a little sauce. Repeat the operation until you finish all the ingredients and bake at 180°C for 30 minutes (ventilated oven), or 200°C for 40 minutes (static oven). Once it is ready, take it out of the oven and move the towers into the cups, for a surprising and original presentation! TIP: the aubergine layers for each tower should be about 4, so that they do not come out of the cup. Before moving it into the cup, wait a few minutes for the ingredients to stabilise. The dessert is ready already… ‘Mia Pasticceria’ takes care of it… choose the flavour you prefer!